European institutions are not the home of rational debate that influences outcomes. But if the rules-are-rules narrative is not replaced it will lead to the break up of the Union. 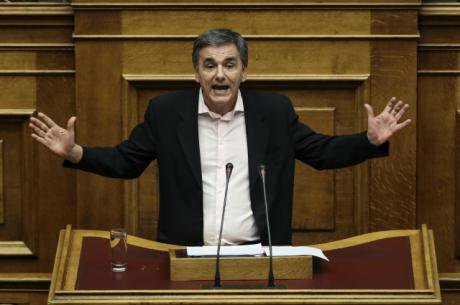 Greece's Finance Minister Euclid Tsakalotos addresses lawmakers during a parliamentary session in Athens, Saturday, Dec. 10, 2016. Paimages/Yorgos Karahalis. All rights reserved. Everybody, it seems, is concerned about the rise of the radical right. In Europe this concern is tied to a recognition that the EU and the Eurozone face growing centrifugal forces. But any coherent response is crippled by the fact that there are two, almost diametrically opposed, narratives on this phenomenon. The social narrative, which is mostly, but of course not exclusively, to be found in Southern Europe and on the Left of the political spectrum, argues that Europe is failing a large number of its citizens. Not only did they face the brunt of the crisis, but they have no confidence that they will participate in any recovery. European institutions are stuck in a pre-crisis time zone when the major problems were perceived to be inflation and fiscal irresponsibility. The result is not only that we are stuck with the most independent of central banks, fixated on the inflation risk, but also a Growth and Stability Pact which acts as a permanent straightjacket. Within the Eurozone matters are worse still. Having relinquished the devaluation option, monetary union has not come up with adequate substitutes in the form of fiscal transfers or other policy instruments. Europe faces a problem of low growth, high unemployment, and deteriorating infrastructure and social welfare. It needs to be cooperating but on a development agenda which needs a different economic and financial architecture. Without such an agenda, one which can incorporate the concerns of citizens about wages, pensions and benefits, the social narrative concludes that right-wing populists will continue to gain ground as they appeal to the material needs of the centre-left’s and centre-right’s social base. The rules-are-rules narrative takes a very different view. It is found mostly in the North, and on the right, but again there are exceptions; notably, in this case, those on the centre-Left (does anybody remember the “Third Way”?) who are still smitten with the Blair, Schröder and Simitis framework. The argument here is that the EU is based on rules and that changing those rules every so often can only undermine the credibility of the European Union and the Euro. Moreover citizens of the North are tired of “bailing-out” those in the South that either cannot or are unwilling to abide by the rules. There are limits to solidarity and any further weakening of the rules provides grist to the mill of the populists. Thus, the argument goes, to address, for instance, financial instability we should reduce risks before engaging in sharing any remaining risks. The way to address the social problem is to carry on with fiscal orthodoxy, carry out structural reforms and improve competitiveness. European-wide investment initiatives can help, there can be some further pooling of resources for expenditures that are for the good of all (refugees for instance), but fiscal transfers are out. The rules-are-rules agenda will sooner or later lead to the break up of Europe. In short Europe can be saved as a unified whole (or some parts of it can? ), if all member states become more like Germany. If they don’t, then populist, and centrifugal, forces will grow within the North and undermine the European ideal. It would be naïve to think that the underlying differences could be resolved completely at the level of rational argument. For of course the balance of power between the proponents of the narratives is most unequal. But that surely is the point. If Europe does not have a public space for such deliberations, and if European institutions have a tendency to eschew rational debate, then what confidence can ordinary citizens have in the outcome? How can fear and uncertainty, the underpinnings of right-wing populism, be addressed? And this is where the narratives are not to be treated as equal. For the social narrative has a lot of intellectual support, and not just from economists, for its critique of the monetary union that has evolved in Europe, and for the accompanying and devastating effects of austerity, and growing social and regional disparities. But, more importantly, it addresses the fears of those turning to the radical right, by proposing a shift in agenda and suggesting reform of existing priorities. It understands the role of xenophobia in radical right-wing politics, but considers that such problems cannot be addressed without alleviating the fear and uncertainty that feeds the cultural agenda of the Right. As Thomas Frank argued, in his book on the politics of Kansas politics, the ability of the radical right to mobilize the social base of the progressive block is predicated on that block not mobilizing its own base on priorities that challenge the neoliberal order. Rules-are-rules, on the other hand, promises just more of the same. The basis of confidence of why this should lead to different outcomes in the future, than it has done in the past, is far from clear. The following year will show whether one, or other, of the two narratives will prevail, or whether there than can be a real effort to go beyond a dialogue of the deaf and and converge on a new narrative. The success of the European project can only be based on two of the three possibilities of the previous sentence. In short, the rules-are-rules agenda will sooner or later lead to the break up of Europe.